Their research, conducted in mice, suggests that the bacteria that cause urinary tract infections take advantage of a cellular waste disposal system that normally helps fight invaders. In a counterintuitive finding, they learned that when the disposal system was disabled, the mice cleared urinary tract infections much more quickly and thoroughly. Scientists were surprised to find that microbes that cause urinary tract infections are easier for mice to defeat when a disposal system inside cells is disabled. 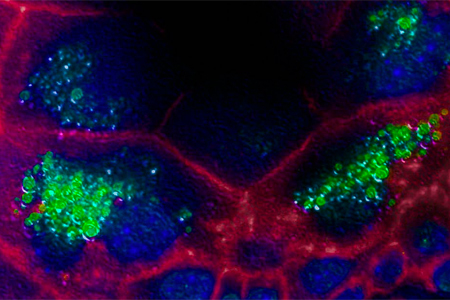 In this image, pockets known as vesicles, which appear green, cluster abnormally in bladder cells after an infection has been cleared. The results will be published the week of June 18, 2012, in the early online edition of The Proceedings of the National Academy of the Sciences. Urinary tract infections are very common, particularly in women. In the United States alone, annual treatment costs are estimated to run as high as $1.6 billion. Scientists believe 80 percent to 90 percent of these infections are caused by the bacterium Escherichia coli (E. coli). Data from the new study and earlier results have led Mysorekar and her colleagues to speculate that E. coli that cause recurrent urinary tract infections may hide in garbage-bin-like compartments within the cells that line the urinary tract. These compartments, found in nearly all cells, are called autophagosomes. They sweep up debris within the cell, including harmful bacteria and worn-out cell parts. Then, they merge with other compartments in the cell that are filled with enzymes that break down the contents of autophagosomes. In the new research, Mysorekar teamed with colleagues at the School of Medicine who had developed mice in which both copies of an important autophagy gene, Atg16L1, were impaired. Co-author Herbert W. Virgin, MD, PhD, Edward Mallinckrodt Professor and head of the Department of Pathology and Immunology, and others created the mice to study Crohn’s disease, a chronic bowel inflammation associated with mutations in Atg16L1. Co-lead authors Caihong Wang, DVM, PhD, a staff scientist, and Jane Symington, an MD/PhD student in the Mysorekar group, infected the mice with E. coli. The researchers found that bacteria levels in the urinary tracts of the modified mice decreased much more rapidly after infection than they did in normal mice. Cells lining the urinary tract in mice with the mutated gene also had significantly fewer dormant reservoirs of E. coli than in normal mice. The scientists identified structural changes in urinary tract cells of the mice with Atg16L1 mutations that may help explain their unexpected results. These changes may have made it much more difficult for the bacteria to find and break into autophagosomes, Mysorekar says. The altered gene also was associated with changes in the immune system. In the modified mice, E. coli infections in the urinary tract led cells to produce more inflammatory immune factors and prompted additional bacteria-fighting immune cells to come to the site of the infection. Mutations in Atg16L1 are quite common, according to Virgin, although not everyone who has a mutated form of the gene will get Crohn’s disease. Mysorekar plans to investigate how E. coli takes advantage of a fully functioning autophagy system in mice with urinary tract infections. Wang C, Mendonsa GR, Symington JW, Zhang Q, Cadwell K, Virgin HW, Mysorekar IU. Atg16L1 deficiency confers protection from uropathogenic Escherichia coli infection in vivo. The Proceedings of the National Academy of Sciences, early online edition, week of June 18, 2012. Funding from National Institute of Child Health and Human Development Grant T32-54560 (to G.R.M. ), U54AI057160, Project 5 (to H.W.V.) and K99/R00 Pathway to Independence Award DK080643 (to I.U.M.) supported this research.